Before the War: Jan Gordon on "England's Place in Art"
In the Liverpool Daily Post, Tuesday 25th July 1939, Jan Gordon reported on "England's Place in Art." For the first time the International Congress of the History of Art will be held in this country, centred at University College, London, opening on Monday and closing at the end of the week. Among the more important papers delivered will be Mediaeval English Embroidery,” by Mrs. Christie, Holbein and Henry VIII.,” by Professor Ganz, and The English Country House,” Professor Webb. The King has given permission to members to visit the treasures at Windsor Castle and Buckingham Palace, and other visits to important historical collections have been arranged. THERE were half-a-dozen of us. I suppose you'd call us old buffers, though we'd all done our bits, more or less, in the other war, and that young Flight Lieutenant was our meat. I mean, whatever way you look at it, this war has turned out to be a beastly news-less war, and the whisper that this young chap had had something to do with the pamphleteering of Germany from the air had us all on our toes. Hush-hush and all that sort of thing agreed to, of course, but all the same a little bit of something with a genuine personal touch to it does bring a bit of glamour into the rather dismal business of reading what happens to slip out from a crack in the Ministry of Information to the Press, or hearing what amounts to the same thing over and over again on the wireless, interspersed with selections by Shamus McOrgan. 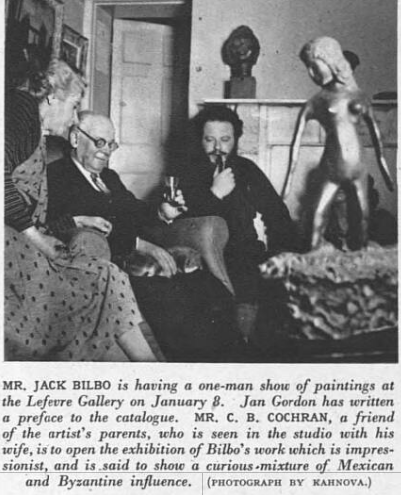 The Sketch, Wednesday 30th December 1942 makes mention of an exhibition of the works of Jack Bilbo (1907-1967). This was the year after he opened "The Modern Art Gallery" in London. The exhibition was held at the Lefevre Gallery in January 1943. Jan Gordon wrote the preface to the catalogue. Jan and Cora Gordon had also exhibited at the Lefevre, for example in 1934 and from March-April 1937. Details of their other exhibitions can be found here. MR. OSWALD IMPEY, R.O.I., was not tough. Definitely not. He was emaciated, he stooped, wore thick spectacles, had a wispy, straggly beard; and as for his hair, it was thin on the top, and what ought to have been up there seemed to be trying to crawl down between his neck and his open collar. 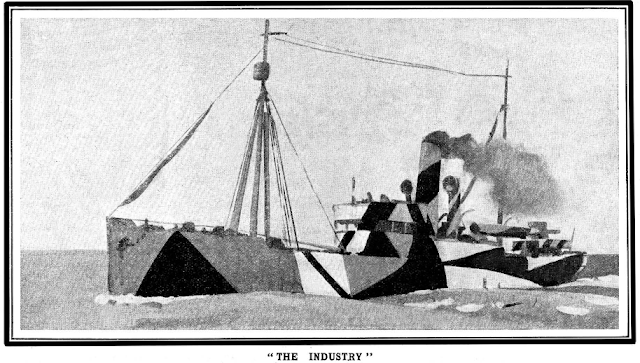 He was an enthusiastic landscape-painter and, like very many other artists, had sent in his name for the camouflage corps, but had never had an answer. So on that October day, which had started out fine but had afterwards clouded over heavily, he was standing before his easel in a field in Norfolk, painting autumnal tints. 1919: "Jan and Jo Gordon, of Serbian, as well as of artistic fame"
"The Sketch" of Wednesday 5th February 1919 has a segment on "A DIAGNOSIS OF DANCING" by MARTHE TROLY- CURTIN, author of "Phrynette's Letter from London." 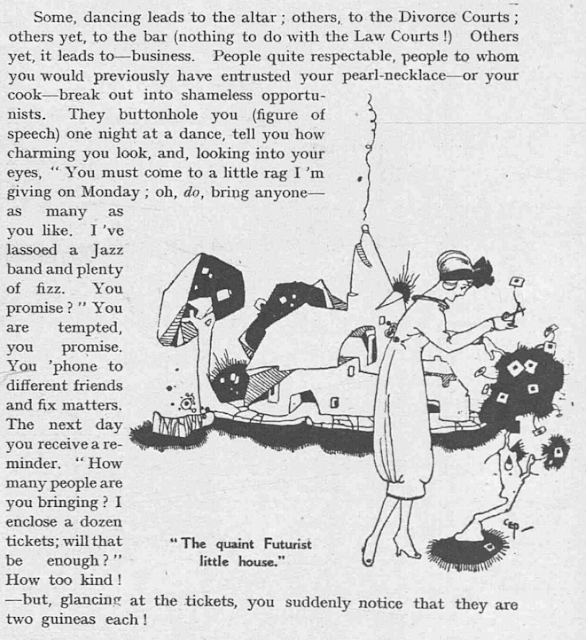 "There was a jolly party on the 18th at the quaint Futurist little house in St. John's Wood of Miss Ella Erskine, the actress. The costumes were varied and amusing, ranging from that worn by Mr. Leoneff, the Russian dancer, to the Quaker like grey dress worn by the beautiful Eve Balfour, whose portrait by Take Sato you have lately admired in Colour. I also noticed, dancing in gay clothes and gay mood, Jan and Jo Gordon, of Serbian, as well as of artistic fame. Lady Dorothy Mills wore black with green things." Like the Gordons, Lady Dorothy Mills was a traveller, thought to be the first "white woman" to visit Timbuktu ("The Road to Timbuktu" 1924), and a later explorer of the Orinoco River ("The country of the Orinoco" 1931).